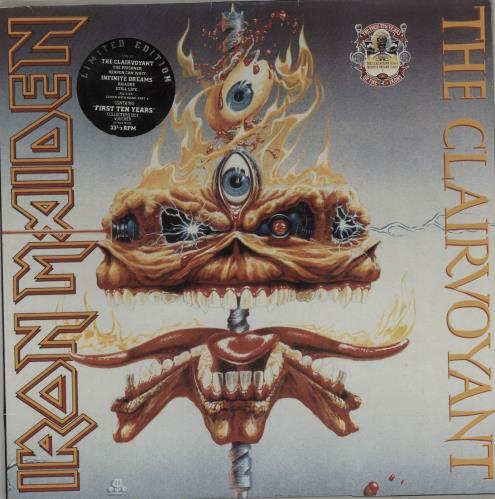 IRON MAIDEN The Clairvoyant / Infinite Dreams (1990 UK 7-track limited edition vinyl 12" single double pack, part of the 'First Ten Years'series. Featuring live tracks recorded at Castle Donington and Birmingham NEC in 1988. Housed in a stickered colour gatefold picture sleeve incorporating the original artwork for both releases. The sleeve is very good with some minor general wear, whilst the vinyl remains excellent with only a few light surface scuffs, an ideal play copy IRN10).